A 75m vision for Harrogate... but plans have yet to be submitted to the council. The developer behind £75 million plans for luxury apartments at Harrogate’s former council headquarters says delays mean there will be no actual work on the site until 2019 at the earliest. Adam Thorpe had said in March of this year that he hoped to be applying for planning permission “within the next few weeks” and that he expected to begin actual work on site in July or August ready for completion in 2020. The man behind the plan, Adam Thorpe. Adam Thorpe said: “There would have been no delay had it been simply the building. It’s been incorporating the building and its new use with the environment it sits sympathetically within. “Progressing the design on all aspects of the scheme has taken longer than expected but we are delighted with the improvement to the gardens and public realm. “Our architects Squire & Partner are working well with the planners at Harrogate Borough Council and we are in the planning stage with formal planning looking to be submitted within the next few months. But the news of has been met with dismay by Harrogate Civic Society who said the longer the building remained empty the worse it would be. Henry Pankhurst, chairman of Harrogate Civic Society, said: “After what Mr Thorpe had said to the Advertiser several months ago we thought that the timetable must have slipped or fallen off a cliff. When Harrogate Borough Council first announced the sale back in 2014 to help facilitate its move to a new, £12 million purpose-built Civic Centre, the fear wasn’t just about the financial implications but the sheer complexity. 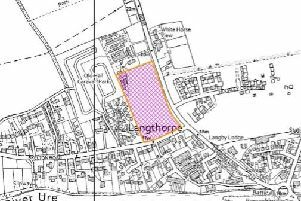 After early hopes of it turning into a hotel failed to materialise, Harrogate Borough Council then revealed the apartments plan and its preferred bid in March 2017 - Harrogate property developer Adam Thorpe. What he unveiled through his firm ATP (Crescent Gardens) LTD was the ultimate in high-end restoration. With its ten to 14 apartments and two penthouses, at prices ranging from £2.5m to £10 million each, there would be nothing like it outside of Mayfair, he said. And the glittering plan, which has made headlines in the national press, also included utilising Harrogate’s key civic areas for public use. But it is this very complexity which Adam Thorpe now says is a problem. He said: “The link between residences, restaurant, public gardens, art gallery and wellness spa has been complex. “Bringing the collection of residences, lifestyle and wellness to Crescent Gardens hasn’t been created outside of London before so it has been a project of pioneering vision to create a home we knew our clients would wish to live in. “The architects, Squire & Partner have been excellent at creating a vision for the Spa Quarter at Crescent Gardens. “Harrogate Borough Council have bought into the scheme and, in particular the way in which the art gallery and restaurant blend with the improved gardens to create a huge uplift in the public realm. “Our agents, Carter Jonas and Toby Croft Residential, have been working with clients on allocation of units . We have been oversubscribed on each floor - no units are any longer available. But the Harrogate Civic Society believes the fact the developers’ plans involve taking control of a public road which is a right of way, may eventually scupper the whole deal. Henry Pankhurst said: “We would not be surprised if it never happened, especially if permission to close the road wasn’t forthcoming.